October 29, 2014--Back from the framer just in time for Halloween. December 17, 2013--Found these non-scary cuties (buttons and witch applique) while at Britex in San Francisco, CA, to place onto Halloween Treat. Now to decide whether or not to have this project framed or simply backed with fabric and an easel. August 23, 2013--This little bit of scariness is done. 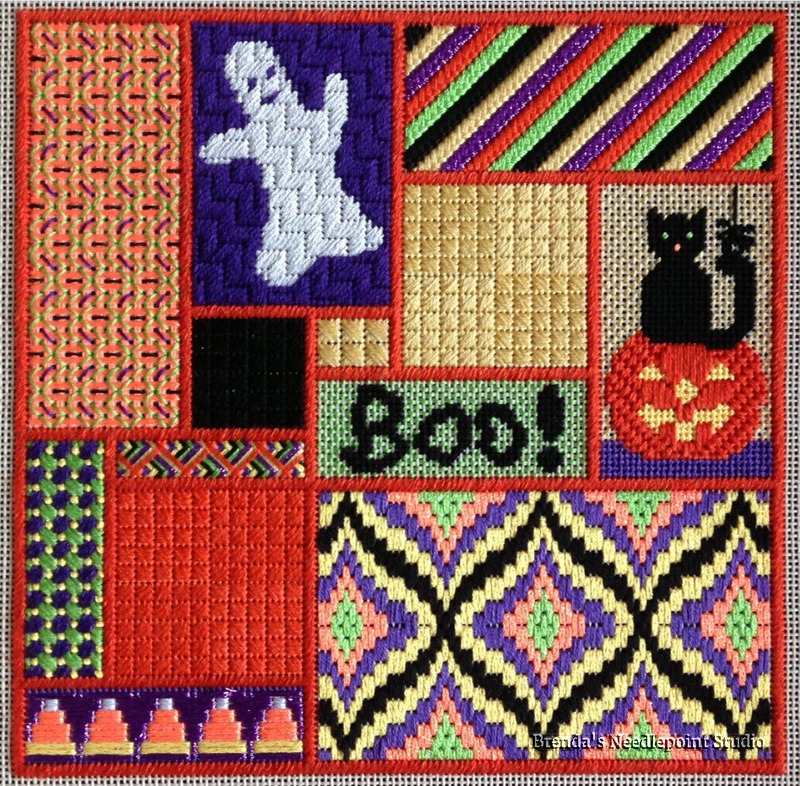 Love the ghost and bargello sections. Now to find the most frightening buttons possible to place in three of the areas filled with scotch stitches. If the best buttons have shanks, I can cut them off with wire cutters and secure them to the canvas with stitches around small parts of the design. Would love to find a little, dangly skeleton. August 17, 2013--Started working on this delightful Halloween Treat after our ANG chapter met on Monday and went over all of the sections. Thank you RJ for a wonderful job in highlighting areas which will require some attention. We started with Area 2 shown below. It's unfortunate the camera doesn't pick up the shine of the RG Petite Sparkle Rays used for the ghost. It looks like he's shimmering right up to you out of the background. July 8, 2013--Delaware's Seashore Chapter of ANG is doing Marilyn Owen's Halloween Treat, taken from the most recent Chapter Project Book. Before we can have our class at the August meeting, we were assigned prestitching of the outline. 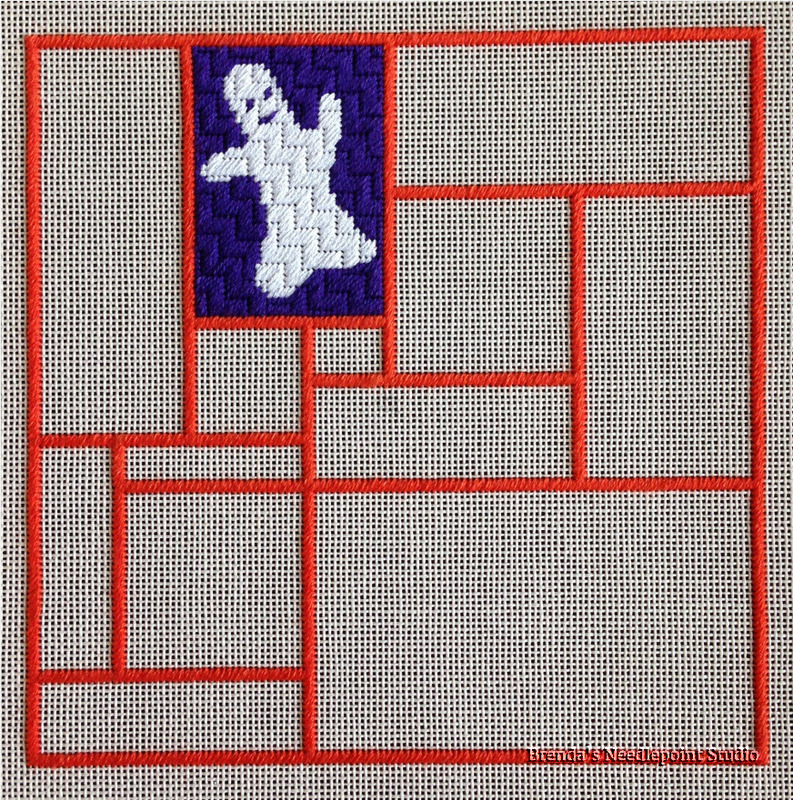 Had to concentrate on my stitching at each intersection--the gobelin stitches are over two except at the intersections where some were over 3 (avoiding a lot of over one compensation). 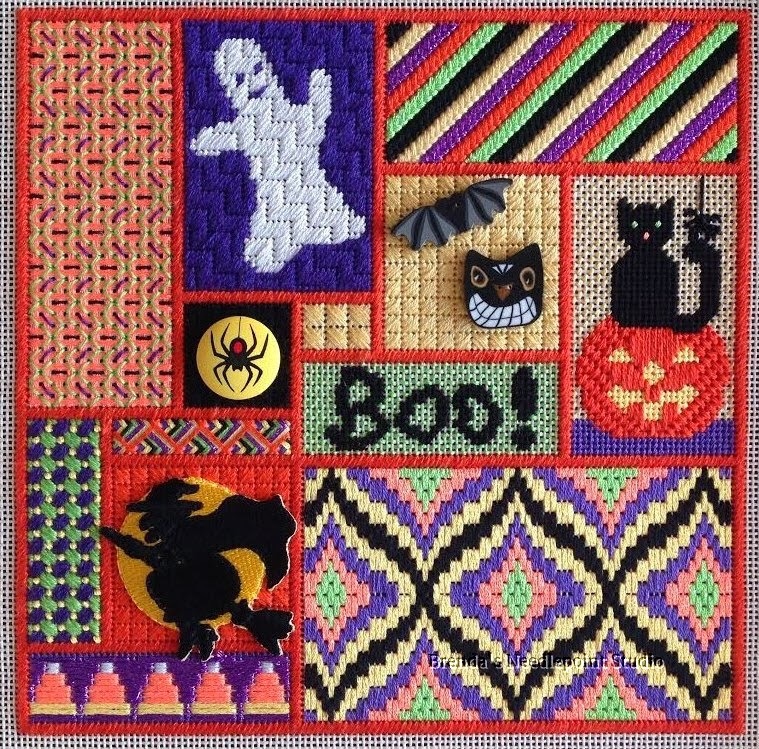 Looking forward to getting this completed in time for Halloween.